It had been way to long since I last saw Leftover Salmon play together as a band. I recall the last time, way back in 2004, driving to the Grey Fox Bluegrass Festival in upstate New York, destined to see the band play as a festival headliner in one of their final gigs before ‘hiatus’. I was a frequent listener of Leftover Salmon’s albums as a east coast college student in the late 1990’s, and had seen the band several times sporadically during that time period. Essentially, they were the band that got me interested in Colorado’s music scene many years ago. Since that time, Leftover Salmon has been a big influence to subsequent ensembles such as The String Cheese Incident, Yonder Mountain String Band, Elephant Revival, and numerous others. The band had only reunited for a handful of gigs in the past several years, as band members’ other collaborations took priority. 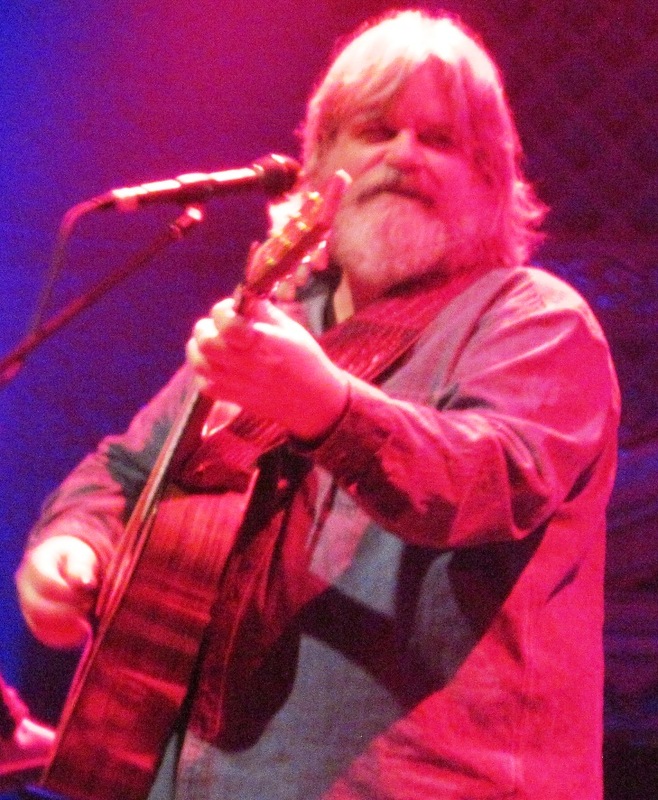 However, the unique and frolicsome nature of Leftover Salmon’s musical creations and animated performances were missed. Aware of the bands various lineup changes throughout their career, I was ecstatic that the lineup has remained fairly consistent behind founders Vince Herman and Drew Emmitt. (The lone new addition being the highly-touted Andy Thorn, taking over the banjo duties). Attending a night of a special holiday run at a favorite Denver, CO venue seemed the perfect opportunity to bring myself back to the fold. Slotted to open the festivities was Fort Collins, Colorado’s Head For The Hills. These rising bluegrass mavens are one of the Front Range’s hardest working bands, and always a treat to the ears. The long lines for entry to the sold-out Ogden Theatre relegated me to only hearing a good portion of their set from the exterior, but I did make it inside in time to hear their extended rousing cover of the 1980’s Yes song “Owner of a Lonely Heart”. I am quite a sucker for bluegrass versions of rock songs, so this was a perfect warm-up to the main event. The house music blared Bob Dylan right up until Leftover Salmon took the stage. This made for great foreshadowing, as the opening number was a cover of Dylan’s “Tangled Up in Blue”, sung by Drew Emmitt. Right from the start of this tune, the stars on this take were Drew and banjo player Andy Thorn. After several minutes, Drew steered a long segue into “Pay My Dues”. A strong jam carried by Thorn’s banjo kept Vince Herman smiling as he egged-on Andy and encouraged him to show off his chops. When Thorn’s soloing reached a peak, the jam snuck into Little Feat’s “Two Trains Runnin’”. Keyboardist Bill McKay led the muscular vocal on this one, and punctuated the number with the swirling sounds of his Hammond B-3 organ. Another captivating banjo solo by Thorn, and the band led back into “Pay My Dues”. Twenty minutes after the band took the stage, the band paused to acknowledge the crowd’s cheers. Vince Herman commented that “Music sure feels good” right before the band started the bouncy “Everything is Round”. This feel-good song had everyone smiling and several twirling as the party continued. At the conclusion, Herman excitedly announced that the band would be heading into the studio to record a new album. 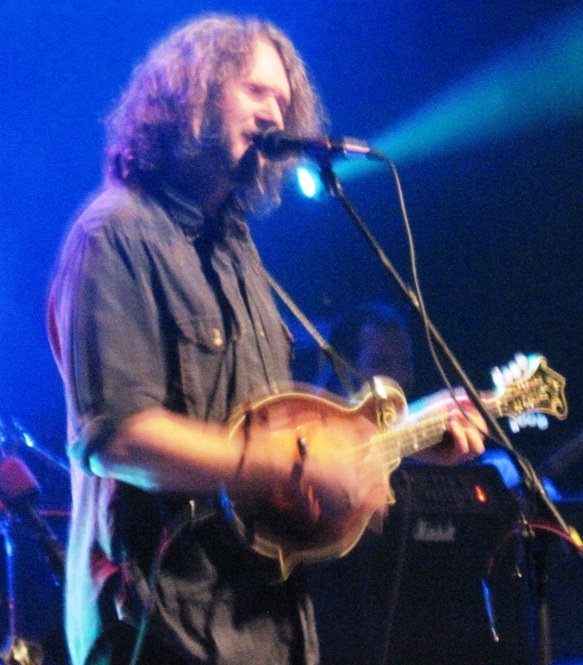 Drew Emmitt exchanged his acoustic mandolin for the electric, then chomped out the intro chords for “The Other Side”. This song has long been a favorite Salmon tune of mine, primarily because of Drew’s slide mandolin solo, but this take had Andy Thorn taking the first solo and reaching the highest registers of his banjo, followed by another thick wall of sound courtesy of McKay’s Hammond organ. Emmitt then finally entered with an absolute scorcher of a solo with his slide on the overdriven mandolin. He wrangled the song back in for the last section of the tune, only to conclude the tune with the slide going all the way up the neck and hitting the highest note possible. Vince Herman hinted that it was Bill McKay’s birthday, and then McKay proceeded to lead the band into his rock and blues groove, “Just Keep Walking”. I noted that Drew Emmitt strapped on a Fender Telecaster for this tune, and shredded the guitar solo as well. Bassist Greg Garrison meandered through the tune with a solid low-end rumble, inconspicuously driving the tune from the rear of the stage. Herman introduced the next song, “Blue Kentucky Sky”, as a song he wrote about the first time he saw Bill Monroe play. Herman explained that “he’s been chasing bluegrass ever since” he first saw Monroe play at a bluegrass festival in Kentucky. Andy Thorn began the next tune, “Doing My Time”, with a great banjo intro. This tune likely yielded the most spontaneous jamming of the night, as Herman contributed some flashy flat-picking, and extended instrumental jams carried by Andy’s banjo and Drew’s mandolin went deep into unexpected musical realms, accented by McKay’s phrases on piano. “Doing My Time” clocked in at a solid 15 minutes, and was certainly a highlight of the evening. Before the audience could catch a breath, Herman belted out his trademark “Fessss-tivalll!!! !” call, and a rapid fire “Euphoria” commenced immediately. Such a fun, playful song, Herman was somehow able to sing all the words though a perma-grin, only stopping to allow Emmitt to contribute another slide-mandolin solo as the tempo continued to increase. After the sequence of tunes so far in the show, it was a good time for a set break. Set 2 opened with another favorite Salmon tune of mine, “Dance On Your Head”. This Calypso-influenced tune is one that well-represents Leftover’s Salmon’s unique sound. Great vocals by Herman, and a walloping Hammond B-3 solo by McKay, and a great way to open a set. Vince Herman told a story about a Thanksgiving meal of stuffed squirrel at a friend’s house, then introduced the next song as “Squirrel Heads and Gravy”. This humorous song featured some fast picking, and playful lyrics that rhymed with the title, such as “Roll another fatty!” and “My Ferrari”. Drew Emmitt also picked up his fiddle for the first time in the show, showcasing his skills on yet another instrument. The country song, “Get A Rolling” was next, with more fiddle from Drew, who sang the tune in his country drawl. Another danceable tune followed, Herman’s “Oh Eliza”, with its memorable chorus and head-bopping chords. 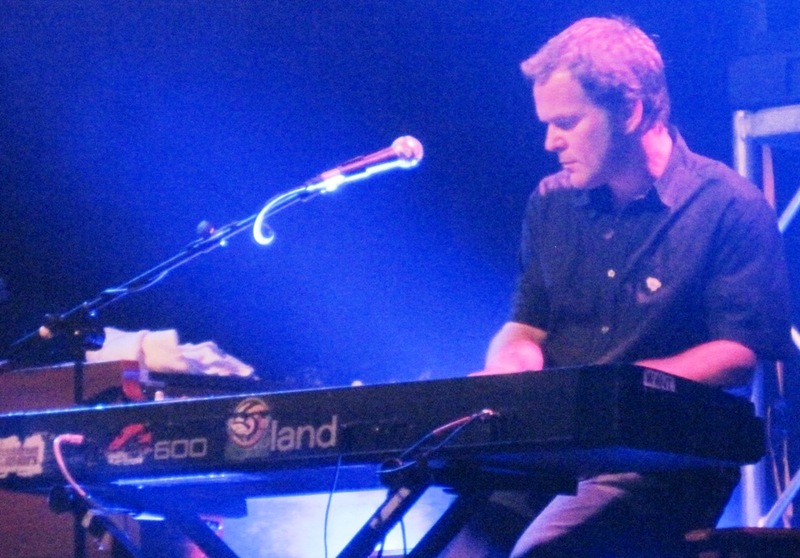 Band newcomer Andy Thorn sang the next song, the slower “Light Behind The Rain”, after a dynamic instrumental build up. “Bend in the River”, another of Drew Emmitt’s country ditties (with a memorable chorus that one might sing while driving through the hills to a weekend destination), was followed by Bill McKay’s take on “Junco Partner”. This New Orleans-inspired, boogie-woogie selection is an old tune from at least the 1950’s, about getting high on booze and drugs, and showcased some tricky slide guitar by Emmitt, and a solid jam in which Andy and Bill traded licks off each other on banjo and piano, respectively. The next song was the laid back and beautiful rendition of “I Don’t Know You”, highlighted by rolling piano and calm vocal harmony. At the song’s conclusion, Vince coaxed the crowd with “Let’s hear it for music, huh?… Don’t you wish everyday could be like this?”. Herman was clearly touched by the holiday spirit and felt fortunate that he could be playing music for a living for over twenty years, creating a sense of community around his music. At this point, it was time for another classic Salmon tune, “Ain’t Gonna Work Tomorrow”. This simple blue-grassy song, featuring some furious picking, is nostalgic for me, as I used to sing a revised version to a ‘slacker’ college roommate of mine in the late 1990’s, in which I changed the lyrics to “Ain’t Going to Class Tomorrow”. Thus, this song brings up fond memories of my younger days. The version on this night hit the spot, eventually leading into an impromtu drum jam from Jose Martinez, culminating in a furious mandolin and banjo jam, which segued into a cover of Led Zeppelin’s “Whole Lotta Love”. Herman’s oft-played “Can’t Get No Better” was next in the set, followed by a spacey interlude which soon led into a monster “Breaking Though”. Yet another well-written Drew Emmitt song which I thoroughly enjoy, the dynamics in this tune hit every corner of the theater. Andy Thorn had an extended banjo passage in which he was more subdued than other jams during the night, but the notes he chose were beautiful and eloquent, aiding the band in extending the song into a ten-minute masterpiece. The set closer was the high-octane reggae-rocker “Better”, but there would be more fun to be had in the encore. The band sauntered back out to the stage for the sold-out crowd, engaged in some spirited band-member introductions, and started the extra session with the audience participation song “Hot Corn, Cold Corn”. The welcome goofiness of the song eventually subsided, and Emmitt reached for the fiddle again as the band started the Rolling Stone's “Dead Flowers”. A solid rendition of the classic was followed by the last song of the evening, “Rise Up (Wake N Bake)”, and the crowd continued to chant the song’s title as the band left the stage one-by-one. This first night of the two-night Thanksgiving run was a joyous occasion indeed, as Leftover Salmon is one of those few bands that can change one’s disposition through their music. It wasn’t until the next night at the Ogden that Vince Herman relayed the sad news of the passing of ‘Michigan’ Mike Torpie, the bands one-time archivist and creator of the popular Nederland Music and Arts Festival. The band went on to schedule a last minute gig on Sunday, November 26, at Rollinsville, CO’s Stage Stop Inn, as a tribute to Michigan Mike and a suicide awareness benefit. After so many years away from seeing Leftover Salmon in concert, it was a welcome reunion for me. I’m looking forward to catching more of the fun in 2012, when the boys launch a full tour in support of the upcoming new release.